Overview: Our Free Multi Hand Deuces Wild Video Poker game is a multi hand type video poker machine allowing you to choose between playing 2, 3 or 4 poker hands at a time. It is played with one standard 52 card deck per hand however all the Deuces in the deck are wild. Deuces are cards with a face value of 2. The cards are shuffled before each hand. If you want to play just one hand on this game then be sure to try out regular Deuces Wild Video Poker game. Winning Hands: Multi Hand Deuces Wild can be won by getting any one of 10 winning hands, these are; Natural Royal Flush, Four Deuces, Deuces Royal Flush, Five of a Kind, Straight Flush, Four of a Kind, Full House, Flush, Straight, Three of a Kind. Maximum Coins Bet: 20 coins (a value of 20 credits), 5 coins bet per hand on up to 4 hands. 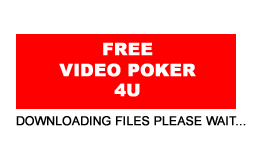 Similar Free Video Poker Games: If you like our Multi Hand Deuces Wild Video Poker game you might also enjoy playing our Multi Hand Aces and Faces Video Poker which also allows you to play between 2 and 4 hands at a time.